I have always been a sucker for the underdog. In the movies, I love the story where the weakling, the geek, the wallflower, the fill-in-the-blank, comes of age, achieves self-realization, and conquers against all odds. 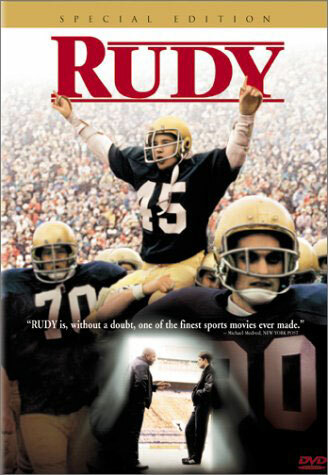 It’s like in the film Rudy, in which Daniel Ruettiger is told that he is too small to play football for the University of Notre Dame. Everyone has to root for the guy. That’s probably part of the reason I chose my profession, school social work. You really can’t ever give up. You just have to keep finding new ways to help, so that everyone can have their moment when they can be hoisted onto the team’s shoulders. The same philosophy has followed me into the garden. As soon as seeds begin to sprout in the greenhouse or ground, the experts say it’s time to weed out any plants that are not keeping up. Huh??? Doesn’t everyone need a chance or two or three? Maybe some plants are slow growers. Maybe they need some extra time to reach their full potential. Maybe they could flourish with some differentiated propagation. Believe me, I am no Mother Teresa of the yard. I have had my moments when I have lost it with a plant. Remind me to tell you about the sunflowers and the squirrels — definitely a Mommie Dearest moment. It’s just that there are times, many times, when I attribute human emotions to plants. Who wants to have a legacy of never bloomed? Years ago, there was a local nursery here that had a separate TLC section full of plants that, for whatever reason, could not be sold, were not selling, or were destined for the trash. It was like an island of misfit plants or an animal shelter, where you can’t take home just one. All they really needed was water and some deadheading, and they could rebound in no time. I would raid the racks, and walk out with so many plants at hugely discounted prices. When I brought them home, Joe would just shake his head. I assured him, though, just give me some time. I was always rewarded for the effort with an amazing show of flowers. And then there are the annuals that reseed themselves in a climate where it’s not supposed to happen. For me, this happens with portulaca and begonias. 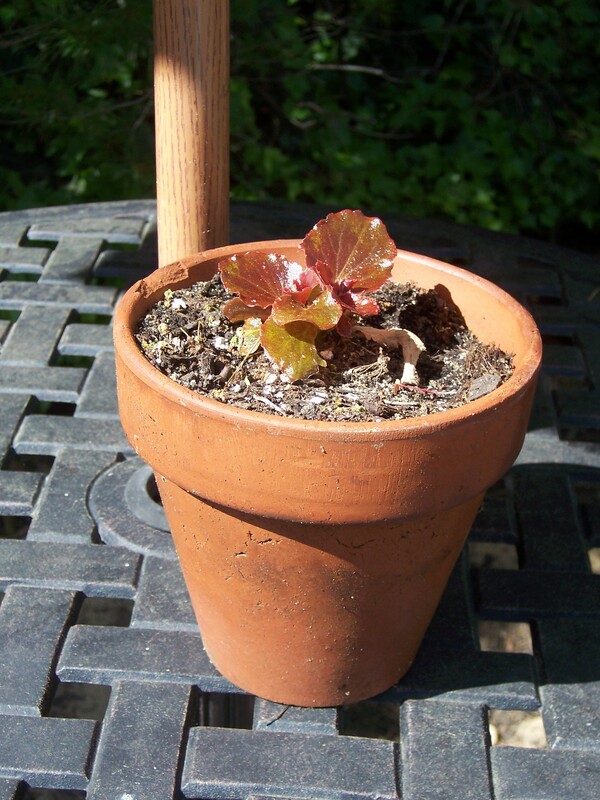 On the northside of my house, I have a slim strip of soil in which I always plant a flat of begonias. It’s in constant shade, and they do well there. This year, as I cleaned out the bed, I found a small begonia growing in the debris — a plant that grew from a seed dropped from the previous year’s plantings. I carefully nudged it out of the ground, and placed it in its own pot. This plant will have a place of honor in the yard. My rationale is that if it fought so hard to live through long dark nights, bitter cold, and mountains of snow and ice, that says something about the determination of the plant to live. I think I’ll call it Rudy. Rudy Begonia. ← A Bird In The Head Is Worth. . . So touching! I love the Rudy Begonia story! I think I’m at a point where I don’t care about the plants as much as I enjoy reading your posts; your writing is endearing yet powerful. You’ve really hit a chord! Write on, Kevin, write on! Thank you for your words and encouragement. Coming from you, it really means a lot. I can certainly relate to this. I find that gardens of the most passionate gardeners contain more than their fair share of rescue plants. The reality is that for every thriving plant, there are many of the same that didn’t succeed for whatever reason. I too love your begonia story- a great rescue! Hello, Kate. Thanks so much for visiting my blog and for your comments. There is a great reward and feeling of accomplishment in rescuing a plant. I do the same “rescue” thing with my plants–it is so satisfying to rescue one, especially when it has special meaning–like a cutting from a friend! Maria, I completely agree. I think that when you can nurse a cutting from a friend, the plant builds upon the story of the friendship. Both become entwined. A local nursery here has a “orphan orchids” section where you can buy bloomed-out orchids for $5. Good deal for someone like me! I have a “no meat left behind” rule at our house. I won’t necessarily finish my wife’s meals, but I will make sure we’re not throwing away any protein. Glad you stopped by. That orphan orchids sections sounds like a sweet deal. It’s very rewarding to rescue anything — even a plant.